What a beautiful, trusting girl you are. "Penny" is the perfect name for you. Hi Penny! Happy Pet of the Day to you! 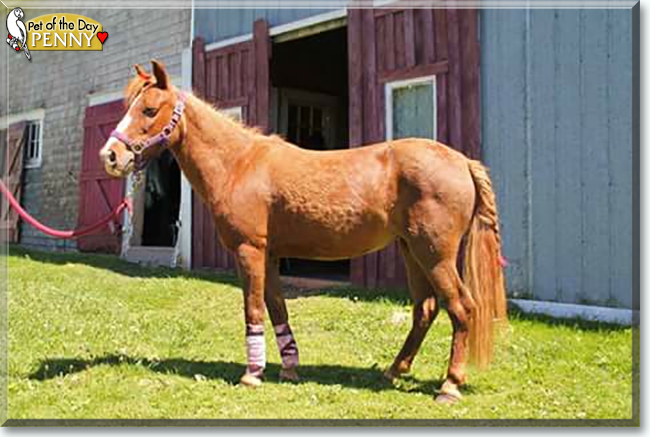 What a beautiful Welsh Pony you are, Penny, inside and out! You may have been with your family but a handful of years, but there's no denying you're home to stay, that the bond of love and trust you and your human share runs deep! Endless thanks to your family for welcoming into their hearts and home one EXTRA special and most deserving girl, tending to all of your needs, including getting your feet back to full health, more importantly, providing you with all the love your heart can hold! And no doubt that under their loving care you will continue to thrive, even learning to pull that wagon, hehe, enjoying every minute of your carefree life with your family to the fullest! How lucky your family is, having a beautiful, gentle and kind, sweet and loving best friend in you, Penny! You're the best, and so very deserving of your big day of honor! Thanks for the BIG smiles, sweetheart! Meeting you today, reading your human's love filled tribute and seeing your heart-melting photos has been a real treat! Hope you're enjoying a very special day of celebration, Penny...spending special time with your *special human,* munching on yummy carrots and apples, being loved and pampered to pieces! Lots of love and a big hug to you, precious Penny, our very special and most deserving Pet of the Day, EVERY day! How beautiful! Your tail is magnificent!!! 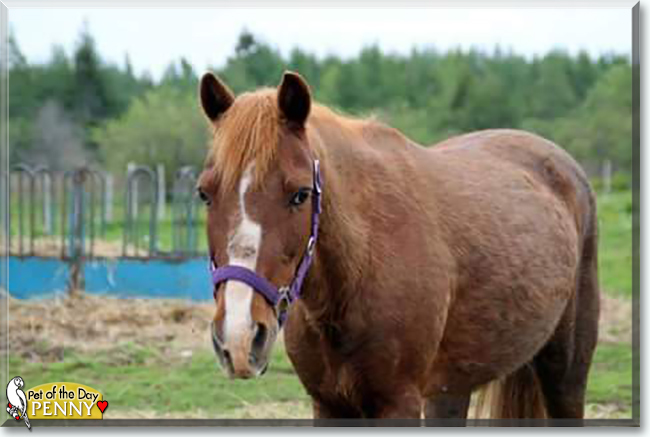 Dearest Penny, what a lovely Welsh Pony cross lady you are, and what a sweet personality you have! You came to your dear family members a couple of years ago with problems with your feet, and they've been helping take care of them for you. You've never complained or balked at the foot treatment, which shows beautifully what a trusting pony you are. Your dear special friend enjoys running around with you, and you are training to pull a wagon, so you clearly can use those feet. You two love each other very much, don't you. What a wonderful love-filled home you share! Congratulations, darling Penny, on being chosen today's Pet of the Day! We hope you and your dear friend and all your family and friends are enjoying a fine celebration, full of fun and lovies and all your favorite games and treats and maybe some special apples and carrots! Last edited by phesina; 04-15-2019 at 04:38 AM. What a beautiful Welsh pony you are, Penny. and are treating your feet.